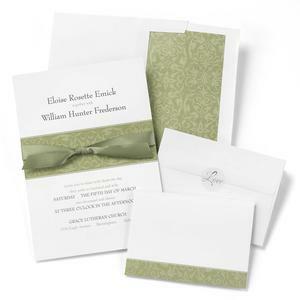 10722 - White invitations with olive band and flourish pattern, and coordinating, 5/8" satin ribbon. 5 1/2" x 7 3/4". Coordinating R.S.V.P. folders, 4 7/8" x 3 1/2" folded. White R.S.V.P. envelopes and invitation envelopes with olive liners included. White envelopes with olive liners included. White envelope seals with silver foil "Love" included. Package of 50.